Today we started our pirate unit and had alot of fun with it! We found the 7 seas and labled them on a map, we reviewed what an island was. 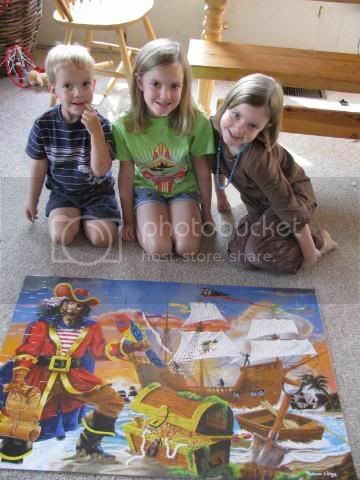 We read several great pirate books and finished up our school morning with a big pirate floor puzzle! Oh and we listened to some pirate music that I found online. It was so cute, the kids were dancing around the room saying, “Arrrrrrr” like pirates!